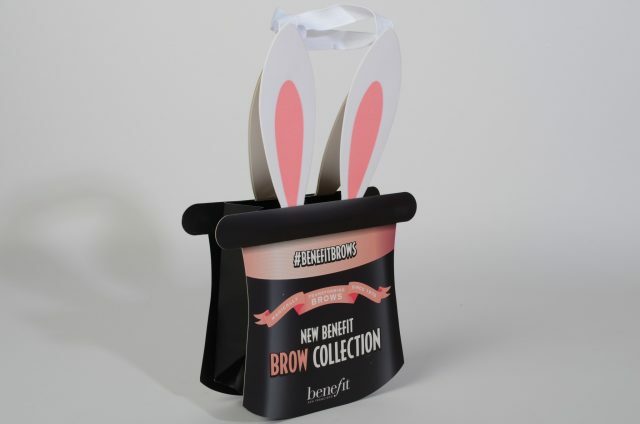 Launched to spotlight the highly anticipated UK release in June of 13 new brow perfecting products – the largest brow collection to date by the cosmetic company – the bags were produced to be given out to customers on purchase of products from the range. In developing a design for the bag, Keenpac used Benefit’s key marketing statement – magically transforming brows since 1976 – as a theme. On this basis the magic hat bag was created complete with stick-out bunny ears as the bag’s handles to represent a magician’s ‘rabbit out of the hat’ trick. Beyond focusing positive attention on the product launch itself, the unique bags have more than played their part. Fully branded to complement Benefit’s exquisite packaging and including the hashtag #benefitbrows, the bag is set to become the most photographed bag on Instagram. The bags are currently on display at Benefit Cosmetics’ concessions throughout the UK. The matt laminated bag itself was constructed from a 350gsm art board for the outer and a lighter weight art paper for the inner. White grosgrain ribbon was used to joins the felt rabbit ears, which were screen printed pink. As packaging specialists to some of the worlds leading and best known brands, we provide innovative packaging solutions that cover all sectors, including: fashion, cosmetics and beauty, watches and jewellery and on-line retail.